Toxoplasma, found in cat feces, makes mice unafraid of cats, and it could give people the courage to start their own businesses. A mind-controlling parasite found in cat feces may give people the courage they need to become entrepreneurs, researchers reported Tuesday. They found that people who have been infected with the Toxoplasma gondii parasite are more likely to major in business and to have started their own businesses than non-infected people. The parasite, which makes rodents unafraid of cats, may be reducing the fear of failure in people, Stefanie Johnson of the University of Colorado and colleagues said. They haven’t actually shown that. But toxoplasma does get into the brain, and it’s been linked to a variety of mental effects in mice and people alike. And fear of failure could be a good thing, Johnson said. Toxoplasmosis has been linked to a greater risk of "car accidents, mental illness, neuroticism, drug abuse and suicide,” Johnson and her colleagues wrote in their paper, published in the Proceedings of the Royal Society B. It might be affecting message-carrying chemicals in the brain called neurotransmitters, or hormones such as testosterone, they wrote. In particular, scientists have studied whether the parasite might increase risk-taking behavior. Johnson is an associate professor of management at the University of Colorado and often told her students about the odd effects of the parasite, which travels to the brains of rodents and causes them to lose their innate fear of the smell of cat urine. That benefits the organism, which reproduces in the bodies of cats. Cats are more likely to eat the unafraid infected mice, thus helping the parasite in its life cycle. People can catch it from handling droppings from cats that are newly infected, but most people catch the parasite when eating poorly cooked meat, the Centers for Disease Control and Prevention says. 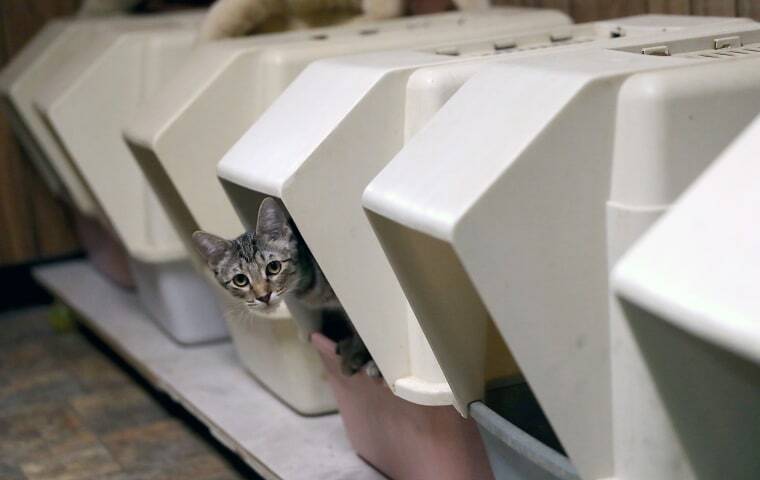 Pregnant women are warned to stay away from cat feces in litter boxes and raw meat because the parasite can cause miscarriages and birth defects. It can make people with weakened immune systems very ill but most people do not even know that they have been infected, the CDC says. “More than 30 million men, women, and children in the U.S. carry the toxoplasma parasite, but very few have symptoms because the immune system usually keeps the parasite from causing illness,” it says on its website. Johnson said she liked to tell her students about the links between toxoplasma and neurotic behavior. “There’s this crazy finding that if you get infected with this parasite, you could get neurotic and nobody wants to get more neurotic,” she told NBC News. Johnson’s husband, Pieter Johnson, teaches biology at the university. “So we thought we should form a collaboration because how often do biologists and business professors get a chance to work together?” Stefanie Johnson said. They set up a study testing students and people who attend seminars on entrepreneurship. “We thought if all these things are true, maybe it predicts this behavior that is kind of risky, which is entrepreneurship,” Johnson said. They gave a saliva test for antibodies to toxoplasma to nearly 1,500 students and to nearly 200 people attending seminars on how to start your own business. Overall, 22 percent of the people they tested had antibodies to T. gondii, meaning that they had been infected at some point. The students who were infected were 1.4 times more likely to be business majors and 1.7 percent more likely to have an emphasis in "management and entrepreneurship," the team found. Among people going to entrepreneurship seminars, infected people were 1.8 times as likely to have started their own businesses. Johnson said her team is going to continue testing the links. “Our next research is conservatism, whether toxoplasmosis affects conservatism,” she said. Johnson says she is not infected, even though she has two cats. “I had, like, four cats growing up. I felt sure I would have it,” she said. But it makes sense, she added. “Being a professor is literally the most risk-averse job you can do,” she said.